The Lalaloopsy dolls were once rag dolls who magically came to life when their very last stitch was sewn, taking on the personalities of the materials that were used to make them. New for 2017, Lalaloopsy has launched its own Netflix Original Series – We’re Lalaloopsy! This launched in January. 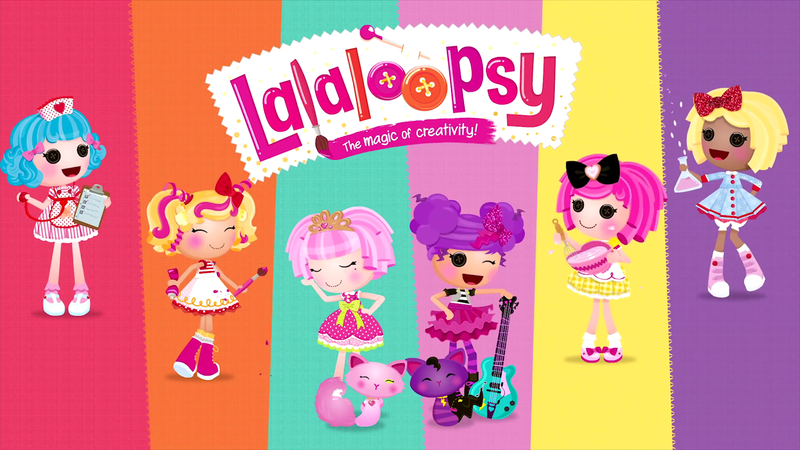 The animated series features all-new original music that brings to life the popular Lalaloopsy line of dolls. The new season trailer can be watched here. To accompany the new series MGA Entertainment is also introducing new Lalaloopsy products based on core characters as seen on Netflix. One of those products is a new Lalaloopsy doll with glitter hair dough. We all love Lalaloopsy dolls in our house. They are so cute with their large heads and big button eyes. If I had to describe a Lalaloopsy doll to someone who had never seen one, then I would say something in between a big doll and a puppet. 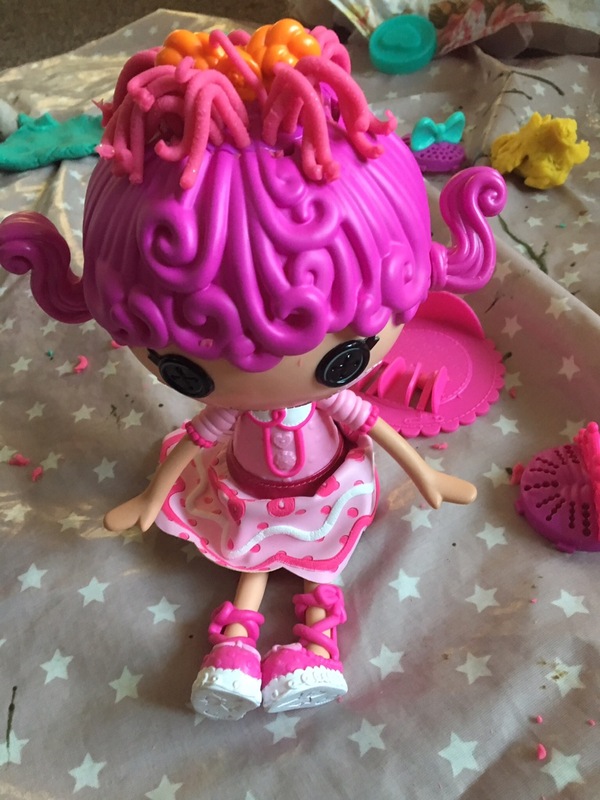 This doll is one of the larger Lalaloopsy’s as they do come in various sizes. She comes with removeable skirt and shoes and 3 tubs of glittery play dough. 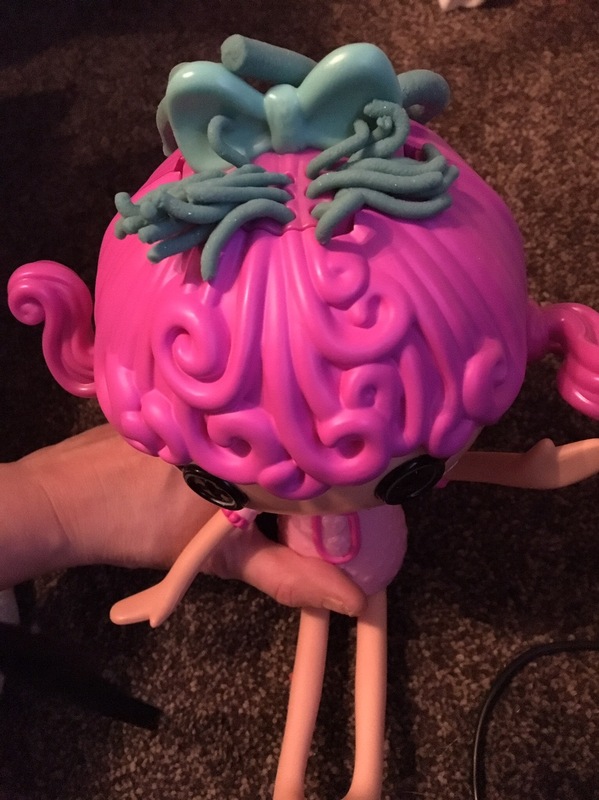 The top of her head opens up and the play dough goes in. 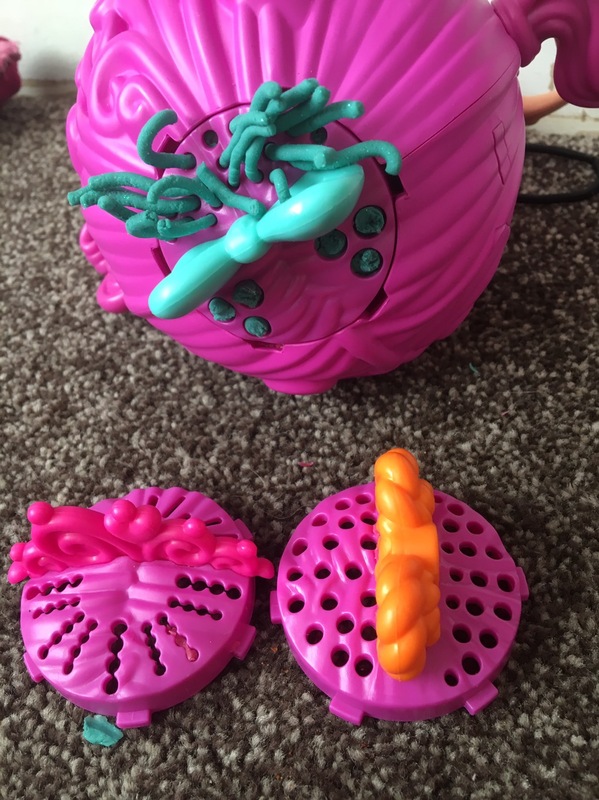 There are 3 pink moulds to choose from which attach to the hole in the head. 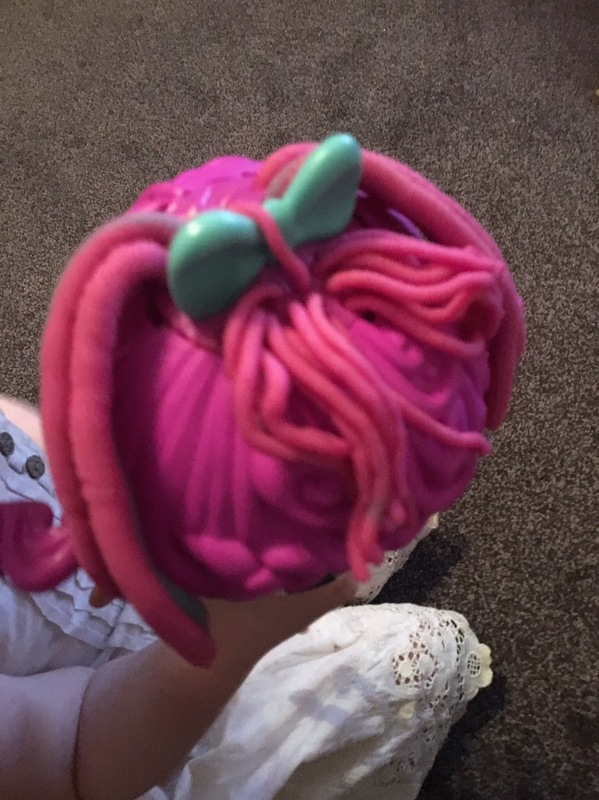 It then locks in and Lalaloopsy pigtails act as handles to lift the play dough up and out through the small holes in the moulds. It then comes out a bit like silly hair. For very long hair, more playdough needs to go in and the colours can be mixed too. Each mould gives different styles of hair and then when finished it can be taken out and more put in. This doll is suitable for ages 3 and over. 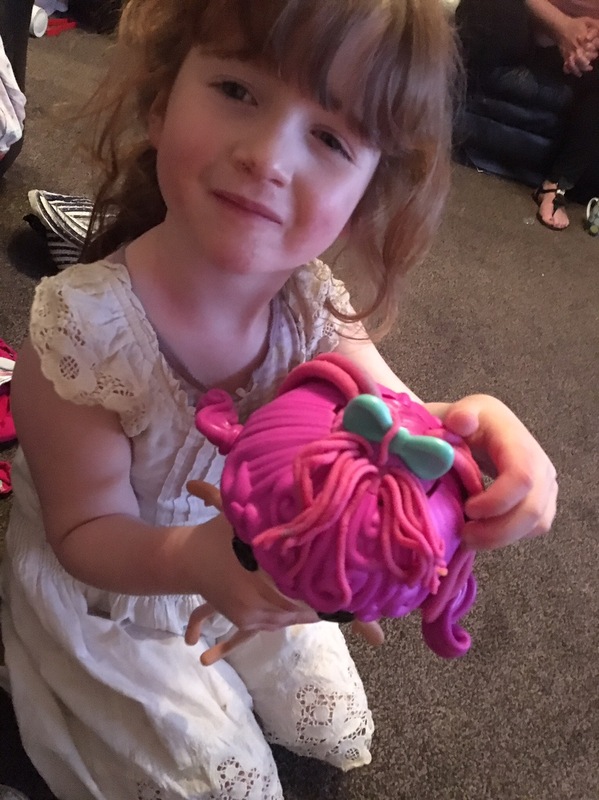 The only slight problems I found with the doll are – the playdough mould which fits in the head can be tough to lock into place even for me when full of dough so a young child may struggle with this. The pigtail handle can also be tiring to turn if longer hair is required. However despite this my 4 year old really likes it. She loves play dough anyway so when it comes with a Lalaloopsy doll it’s even better. The doll also comes with play scissors and clips to use on the playdough hair. As for playdough mess – it really is not an issue with this stuff. Yes Izebella gets the odd few bits on my deep carpet but it doesn’t really stick and easy enough to hoover up. 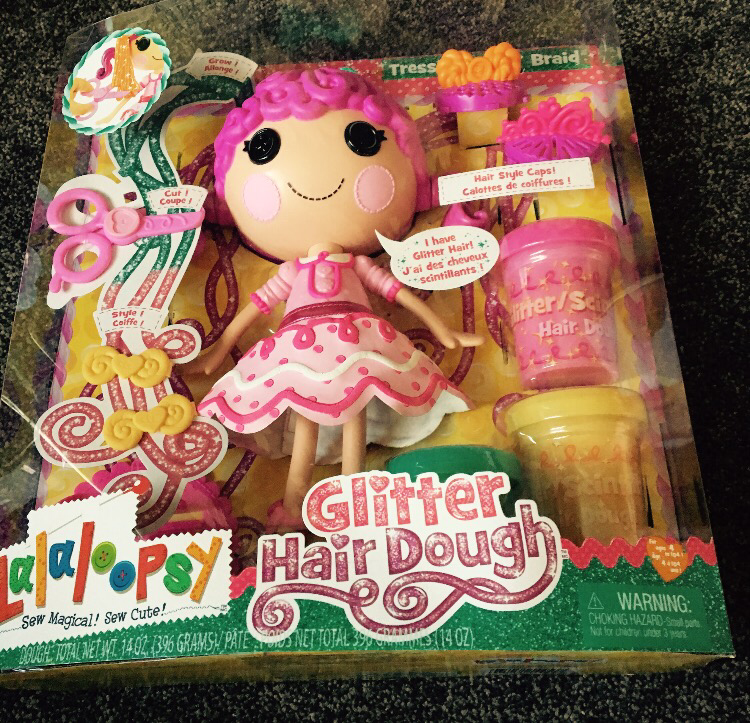 The price for one of these Lalaloopsy dolls with playdough and accessories is £29.99 (RRP). Would I pay this?? Yes I would because I know this is just the thing my daughter loves playing with and it’s much more than a simple boring doll.